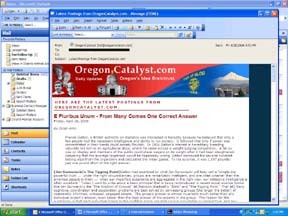 Have You Subscribed to the OregonCatalyst Yet? CLICK HERE or add your e-mail address by clicking on link in the subscription utility section on the home page’s right side menu bar. Subscribed members of the OregonCatalyst blog receive an e-mailed summary of that week’s postings with links back to OregonCatalyst for further reading. NO OTHER USE WILL BE MADE OF YOUR E-MAIL ADDRESS!